In March, the EYN Disaster Relief Ministry Team traveled down to Edo state in southern Nigeria to visit an NGO called the International Christian Center. The NGO located just outside Benin City, was started in 1992 by Pastor Solomon Folorunsho. It’s purpose was to care for orphans and vulnerable children. 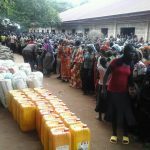 When violence broke out in the Northeast and many people became Internally Displaced Persons(IDPs), the NGO opened its doors to this new set of IDPs. Up to 4000 persons, mostly children and widows, moved south. The women and children are given food, a place to live and education for the children.The costs to house this many people are very high and having enough food to feed them is always a problem. 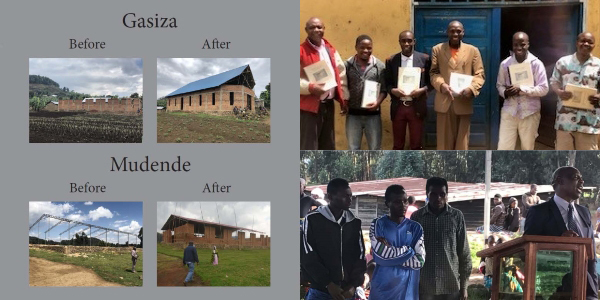 Since so many of the children at the International Christian Center are from the Northeast, leaders from EYN have made several visits to the Center. 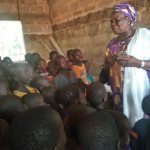 Salamatu Billi, wife of EYN President, accompanied the Disaster team in March. She visited the classrooms and encouraged the children to do their best. She also thanked Pastor Folorunsho for taking in these children. One of the main reasons for the visit was to provide food assistance to the NGO. This was a large undertaking and included: 500 Yam tubers, 140 Gari bags, 53 bags of rice, a pallet of Plantains, 25 Jerri cans of palm oil and 42 bags of sugar. The major challenges of the center according to the camp official are food shortage and medical support. They also spend a lot of money on diesel to provide water. Please pray for the Disaster Team, these children and all those providing their care. Pictures and information provided by Zakariya Musa.